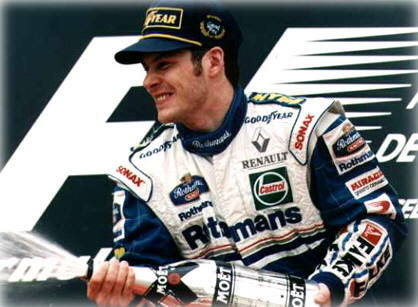 French Canadian, Jacques Villeneuve took his Williams to a dominating Victory at Catalunya in what was to be a race won not only by strategy, but more importantly by the consistency of the tyres that have this season, become so crucial in deciding the outcome of a race. It was also significant in that it was Goodyears 350th Formula 1 win and yet it might not have been. Whilst sounding meaningful, 350 race wins has been relatively easy to achieve. Goodyear have had a monopoly in Formula 1 since Michelin pulled out in 1984 and with a mere three wins in the following seven years from two Pirelli-shod Benettons and a Brabham, a race had only to commence, for Goodyear to claim a victory. In effect Goodyear could write their own Hall of Honour years in advance. With the immersion of Bridgestone into the F1 melting pot, Goodyear have had to cast aside their complacency and, instead of treading water, for the past few seasons, they have now been forced to start swimming again against an ever strengthening tide. The circuit at Barcelona is undulating and abrasive and with several quick and exceptionally long turns, it is tyre hungry in the extreme. Pit stops have to be calculated with care and today, the Spanish Grand Prix proved, that incorrect anticipation of tyre track life would lead to several promising drives amounting to nothing. There was a threat of rain hanging in the air and several teams, not wanting to be caught out for a second race in succession had spare cars prepared for alternate conditions. The clouds did stay for a while before dispersing and the track temperature of 28 degrees was cooler than the anticipated 31 degrees that the circuit experienced in qualifying. Drama commenced even before the race got under way when Gerhard Berger stalled his Benetton at the commencement of the warm up lap, enforcing a start from the rear of the grid, but seconds before the red light sequence started Ralf Schumachers hand shot into the air signifying that his engine too, had stalled. "The engine died on me", he said "and I was penalised and sent to start the race from the back". This gave Berger the chance to regain his rightful 6th slot on the grid as the race got under way. Villeneuve made as perfect a start as team mate Heinz Harald Frentzen made a disastrous one, getting to the first corner cleanly. David Coulthard in the McLaren, launched himself along the right side of the track to stab briefly at the lead before succumbing to Villeneuve and slipping in behind. But Michael Schumacher, as if shot from a gun and in the spare Ferrari, rocketed through the grid from seventh place, magically finding space between Jean Alesi, Berger and Mika Hakkinen, to harry and pass Coulthard on the outside of turn three leaving the much annoyed Scotsman to lead the gaggle of cars through the opening laps. It was obvious after the McLaren set an early quick lap that the Ferrari was not the fastest car by a long way and Schumacher, as usual, was exploiting all of his guile and intuitiveness to maintain speed without losing control. He said, "When my tyre blistered, I was fighting like hell to keep the car on the road, it was sliding like it was in the rain!" By lap 13, with the Williams 16 seconds ahead, Schumacher was holding up a rapidly closing string of cars down to 8th place and was heading for an early pit stop, when Coulthard pulled past the German and immediately pitted himself, with the Ferrari close behind. The string of cars now headed by Alesi and finally let loose, began to separate, Coulthard rejoining in 4th and Schumacher, missing his entry window dropped a further two places back. Both Benetton and Williams on the Goodyear side were expected to run a two stop race whilst the majority, with the exception of Olivier Panis Prost team on a slightly harder compound Bridgstone, opted for three and at one point as the McLarens slipped further and further down the field with each subsequent pit stop, it looked like there might be more. As cars made their stops, it was alarming to see the toll that the track surface was exacting on the tyres. Inexplicably, Frentzen had to stop early with badly blistered tyres whilst his team mate sailed majestically into the distance putting a further 4 seconds on his lead over Jean Alesi by lap 17. Damon Hill in the Arrows was running in a strong 6th slot when the Yamaha engine let go, the car ironically coming to a rest opposite the Williams pit , maintaining Hills unbroken record of non finishes for Tom Walkinshaws team. With little future in the revised Yamaha tested and rejected last week, there seems scant chance of the current World Champion humiliating himself further by signing on with the team for another year. Undaunted and probably glad to have had the chance to be competitive however briefly, Hill said, "I was knocking on the door of the points and the car was going like a train. I thought we must get a finish sooner or later. The engine blew up, it just didn't last." There must be a limit to the number of stiff upper lips that Hill is capable of and it is a credit to him, that he seems to have a few more still left in the bag. 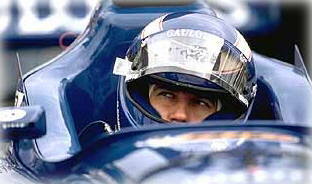 Further fuel for a decision may have come later in the race when Team mate Pedro Diniz suffered the same fate. It wasnt only the Yamaha that made a spectacle of itself. Ralf Schumacher, having a rotten day in a surprisingly uncompetative Jordan - despite team mate Giancarlo Fisichella setting the fastest lap of the race - retired when his Peugeot erupted in a cloud of oil and white smoke on lap 50. On lap 37, It was a pity to see Rubens Barichello setting his car on the grass with engine troubles after such a fine finish in Monaco. "My engine started making the same noise I had heard in the race at Imola. I didnt have the strait line speed to overtake." Team mate Jan Magnussen who finished a creditable 13th for the team, sounded like the Bad Tempered Ladybird declaring that, "The race was very boring. There wasnt anybody to fight with. Only myself the clock and the laps." Lap 28 saw Coulthard making a small inroad into Villeneuves massive advantage and by the time the McLaren was due for a second stop, it was clear that the Canadians tyres were on the way out, but still he kept a commanding lead over Alesis inherited second place. Positions changed as often as the tyres, cars both gaining or losing pace and balance from a second or third set of tyres. Mika Salos Tyrrell Ford suffered a blow out that put him into the gravel on lap 35. Panis harder compound tyres seemed to be holding out as Coulthard, unable to maintain his third position, had to succumb to the Frenchmans pace. The final pitstop by Coulthard saw him fade as quickly as Panis started to shine and with the second and final stops for him and Alesi on lap 44, the finish order was penciled in. A brief flash of red at the front of the field during Jacques Villeneuves final pit stop was the last chance of contention from Schumacher as he then pitted with destroyed tyres and slipped comfortably to fourth where he remained to the flag. However it was Irvines Ferrari, one lap adrift, in a Deja Vu situation from earlier laps, that prevented Panis, Alesi and Schumacher from getting through to continue the chase after Villeneuve. Panis was obviously far quicker and had at that point every chance of catching Villeneuve. "I was behind Eddie for six or seven laps and I just could not get past him. He must have some problem with his eyesight." He said later, "I think he saw that the blue flags were being waved. But it is impossible to talk to Eddie about anything, isn't it?" Irvine on the other hand thought it was Jos Verstappen who was holding up proceedings. "There were so many pit stops I was not sure who was in front of who". Said the Irishman. Alesi, eager to get on with the race even though he stood no chance of passing the Prost, was busy frantically signaling to the marshals "..to wake up and do something about Irvine." This they did eventually, giving him a present of a 10 second stop go penalty which he was obliged to take on the penultimate lap. With Alesis mirrors full of Schumachers Ferrari, it was none too soon for him. "I knew Olivier would find it difficult to pass, he does stupid things," Said Alesi, "I was more worried about Irvine than Michael behind me because he is a strange driver." In vain, Panis powered after Villeneuve leaving the Benetton trailing and holding off Schumacher. But the positions were not to change. With Coulthard on a suspect fourth set of tyres, Johhny Herbert pounced from 6th place on the last lap to move up a place, his friend the Scot unable to control his mal- handling McLaren. As Villeneuve took the chequered flag for the eighth time, surpassing the number of Grands Prix won by his father, Gilles, one couldnt help but stifle a small yawn at the predictability of it all. With so little overtaking action on the track it is a wonder that of the 67,000 in attendance who couldnt see into the pit lane stayed to the finish. It didnt stop Jacques from being happy. To comeback after two barren races and regain his leadership at the top of the standings gave him an obvious moral boost. "It was a very pleasing day for me and for the whole team. After that stupidity in Monaco it is good to win again." He said, "We have thrown away too many races this year and now we have to make the most of things." Regarding the ease with which he pulled away, he went on, "The car didnt feel as good as it did in winter testing, the tyres were different and in the middle of the race when the heat picked up it was very difficult but, being in front and having Michael (Schumacher) second blocking everybody else, gave us a lot of help. We planned for two stops and we knew it was risky for the tyres, but there is more chance of something going wrong when you do three. It was a good all-round team performance." Of course it was most definitely not a good all round team performance and Frentzens three stops did go wrong. With the Germans mental abilities under pressure, still in serious doubt and his inexplicable tyre wear, Williams Technical Director Patrick Head was a disappointed man. "Im very happy for Jacques, but were having a real struggle getting two cars in the points." He said, but excusing Frentzens performance, continued, "The car was way imbalanced and very badly set up. Thats all there is to it." It was nonetheless a fine drive by Olivier Panis who settled any ctiticisms about his inherited win in Monaco last year, by trouncing all but one of the leading drivers. There were no retirements of any significance to give him extra places and it proves that the Panis driven Prost Mugen-Honda has indeed become a finely honed package and is probably throwing doubts into team boss Alain Prosts mind as to the wisdom of his choice to sign with Peugeot next season. Despite criticism of his Bridgestones during a poor qualifying session that left him 14th on the grid, Panis relented, praising their perfect race- worthiness. "The tyres were too hard for qualifying but for the race, were fantastic. They improve all the time." Benetton boss Flavio Briatore will go some way to being appeased after such a dreadfully sparse season so far, by Alesis excellent drive to third place. Not that this will probably be good enough to keep him in the team next year, but for the time being at least it did please the Frenchman. "We finally found a good set-up for low and high fuel loads." a tired looking Alesi said. "To finish on the podium is great and its a lot of Oxygen for everybody in the team." Had it not been a Williams and had Villeneuves set up been as awry as Frentzens, Bridgestone would now be celebrating their first victory. It is also true to say that had a few more midfield teams been running the Japanese tyres, they would have had their first victory a lot earlier.